Ground flaxseed just might be the next best thing for controlling blood sugar. But before “big pharma” gets their hands on it and capitalizes on this plant-based food, why not reduce your blood sugar naturally with one teaspoon daily? Although some experts believe that consuming ground flax can help control blood sugar spikes, it has only recently been tested in diabetics. A study published on the effect of flaxseed powder supplementation in the management of diabetes found that one tablespoon of ground flaxseed every day for a month showed a significant drop in fasting blood sugars, glycerides and cholesterol and a drop in A1c levels (or average levels of blood glucose). As an additional side note, participants who consumed a quarter cup of flaxseed a day for three months showed no additional weight gain. In fact, the group consuming ground flax — compared to those taking flaxseed oil or the controlled group — had slimmer waists. How does flax help control diabetes? A study published in BioMed Central Nutrition Journal found that flaxseed consumption may improve insulin sensitivity in people who are glucose intolerant. After 12 weeks of consuming ground flaxseed, there was a small but significant drop in insulin resistance. Perhaps this was due to the drop in oxidant stress related to the antioxidant qualities of flax, suggests Dr. Michael Greger for NutritionFacts.org. So should you come it for diabetes? Dr. Asqual Getaneh for Everyday Health says that while evidence may be too weak for definitive recommendations, flaxseed is still rich in alpha-linolenic acid (ALA), an essential fatty acid that is beneficial in helping prevent heart disease and related illnesses. Because flaxseed oil is a concentrated source of omega-3 fatty acids, particularly ALA, it has gained a lot of popularity in recent years. But when comparing ground flaxseeds to flaxseed oil, flaxseeds come out on top, suggests WHFoods. 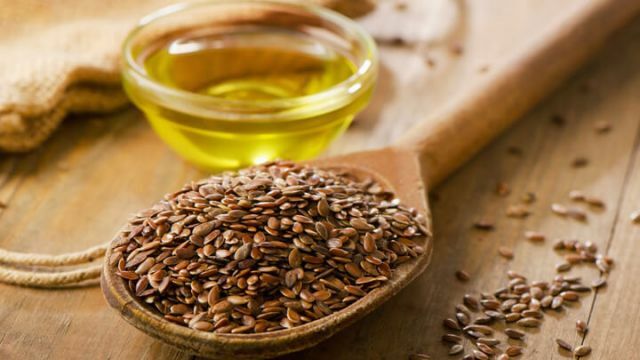 Flaxseed oil does contain more ALA than flax seeds — one tablespoon of flaxseed oil contains 7.25 grams compared to 2 grams per tablespoon of flaxseed — but flaxseeds are a whole food and therefore contain a lot of additional nutrients that you can’t get from the extracted oil alone. Flaxseeds are a rich source of dietary fiber, minerals such as manganese, copper and magnesium, and vitamins such as folate and vitamin B6. In addition, they contain lignan phytonutrients, which have been found to have hormone-balancing and cardiovascular benefits. Some flaxseed oils have lignans added back into them, but the end product is still different from its natural, whole-food form. The bottom line is that each is unique and should not be substituted for the other. Why not incorporate both into your diet and reap all of the benefits that each provides? It’s important to note that to get all of the flaxseed benefits, you must grind the seeds first before consuming to allow for proper digestion. What else can flaxseed do for me? Previously, flaxseed was used primarily as a laxative because it is high in fiber and contains a gummy material called mucilage. Both mucilage and fiber expand when they come in contact with water, adding bulk to stool, which helps it move more quickly through the intestines. But flaxseed can offer so much more. Flaxseed may be helpful for heart disease, inflammatory bowel disease and arthritis among other conditions. In lab tests and animal studies, both flaxseed and flaxseed oil have been reported to lower cholesterol according to research by the University of Maryland Medical Center. While human studies show mixed results, one found that those who added flaxseed to a low-cholesterol diet actually lowered their LDL (bad) cholesterol and triglyceride levels (fats in the blood). Eating foods that are rich in monounsaturated and polyunsaturated fats, including omega-3 fatty acids from flaxseed may help prevent a fatal heart attack. In fact, according to Dr. Grant Peirce for the Heart & Stroke Foundation, some of the most powerful preventative effects on cardiovascular disease come from nutritional interventions, such as Omega-3 fatty acids into the diet. In addition, according to Dr. Grant’s research Omega-3 fatty acids actually work better than any other cholesterol lowering treatment, when it comes to reducing the risk of death from heart disease. Ane flaxseed is one of the richest plant sources of Omega-3 fatty acids. Flaxseed contains plant-based chemicals that act like estrogen and may help reduce symptoms of menopause. One small study compared flaxseed to hormone replacement therapy (HRT) in menopausal women according to The University of Maryland. Forty grams of flaxseed apparently worked as well as HRT for mild menopausal symptoms such as hot flashes, mood disturbances and vaginal dryness. However, researchers are not sure whether flaxseed supplements might actually increase the risk of breast cancer after menopause, just as supplemental estrogen does. So, more conclusive studies are needed. In the meantime, rather than taking supplements include ground flaxseed in your diet. In a small month-long trial of postmenopausal women with newly diagnosed breast cancer, eating flaxseed daily in muffins decreased cancer cell growth according to the American Institute for Cancer Research. However, other studies show some unexplained inconsistency, which may partly reflect a woman’s hormones, overall diet and genetics. So, while some research shows benefits in cancer cell death and prevention of metastases within mice and cellular models, it is recommended that human intake should be through diet only, not supplementation. No more than two to three tablespoons per day at most should be eaten, suggests Oncology Nutrition. For healthier skin, hair and nails Dr. Josh Axe suggests adding two teaspoons of flaxseeds to your smoothie each day. The ALA fats provide essential fats as well as vitamin B, which can help reduce dryness and flakiness. Additionally, ground flaxseed may also improve symptoms of acne, rosacea and eczema and dry eye syndrome. According to a study published in the Journal of Nutrition flaxseeds may improve obesity and support weight loss. Since flaxseed is full of healthy fats and fiber, it helps you stay satiated longer, resulting in fewer calories consumed and subsequent weight loss. ALA fats may also help reduce inflammation, which is a key contributor to weight gain. Do you really have to grind flaxseed? Whole flaxseeds have a hard shell. So in order to get the best absorption, grinding the seed is absolutely necessary to release key nutrients, which also help in digestion. Once the seeds are ground, however, omega-3 fatty acids will start to break down. So, go ahead and grind your seeds up to seven days in advance, just make sure to keep the ground flaxseed refrigerated to slow the breakdown process. For maximum potency, consider grinding immediately before each use. The easiest way to grind flaxseed is with a coffee grinder. The earthy flavor of flaxseed makes it the perfect edition to all types of foods. Add one tablespoon of ground flaxseed to soups, salads smoothies or water daily as part of your health management. Hey Buddy!, I found this information for you: "How To Drop Blood Sugar With This Teeny Seed". Here is the website link: https://www.thealternativedaily.com/drop-blood-sugar-with-flaxseed/. Thank you.